Cinedeck - love this thing! I've been spending a lot of time lately with the Cinedeck Extreme and I'm super impressed with this versatile device. The Cinedeck occupies an interesting place in the market somewhere between high-end, uncompressed and very expensive solid state recorders like the S.Two OB-1 and Codex Onboard and much cheaper and smaller options that compress to editing codecs like ProRes or DNxHD like the Nano Flash and AJA Ki Pro. One thing the Cinedeck has that the others don't is a screen but that doesn't make it a monitor. Despite some helpful analysis tools like RGB Waveform and Clipping Warning, the "on-board monitor" aspect of it is more for interface than anything else. It's not a bad display but it has no calibration controls so I would say the image isn't useful for critical evaluation. Not that any small screen is for that matter. 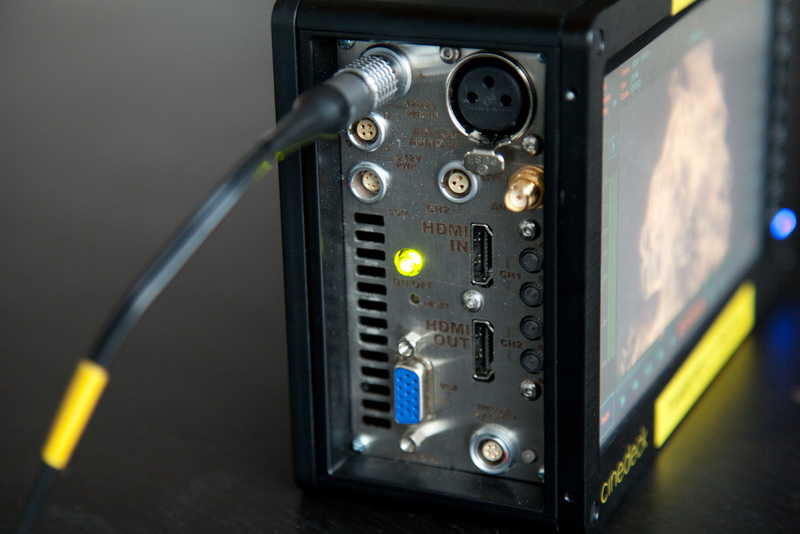 What the Cinedeck is though is a tiny, touch screen computer with the sole purpose of ingesting, encoding, and outputting video signals. Even though this is mainly what it's designed to do, it is still a Windows machine with wi-fi so you can even check your email on it! First of all, I love the touch screen interface. It's very simple, elegant, and intuitive. Most users could pick it up and run with it in no time. The other point that jumps out at me immediately is the fact that this can record an Uncompressed 10 bit 422 or 444 1200/mbps 1080p video signal in realtime. It does this in the Final Cut Pro Uncompressed "codec" resulting in .mov files. The only requirement is special RAIDed SSD drives instead of the standard ones to achieve the throughput necessary to record such enormous files. Here's a Cinedeck "mag" - a standard notebook SSD. I'm not sure the specs for compatibility with the deck but these 256 GB drives from Patriot Media seem to be what Cinedeck recommends. Hot swappable, plug and play. Just stick the thing in there and start shooting. Over 2 hours of high quality compressed recording. Fantastic. Like the OB-1 whose 500 GB mag will only record 30 minutes of uncompressed footage, the Cinedeck's 256 GB mags will record about 17 min in that format. While I think there is something to be gained in uncompressed recording, this current crop of codecs, the Cineform family of codecs in particular are so well engineered that you can capture a very similar quality to uncompressed in a much smaller file. About 1/5 the overall size. Leads me to my next favorite feature on the Cinedeck - onboard Cineform encoding. Cineform NeoHD has quality options that are of a similar bit rate to those found in ProRes and DNxHD but these files are noticeably cleaner with less modulation and artifacting. The only catch is that you have to buy the codec from Cineform if you want to be able to work with the files in your NLE without limitations. It's 500 bucks which isn't cheap but I'm pretty impressed with it so I'd say that's a fair price for a license. You can get the free decoder here which will let you at least let you view the files and transcode to other formats in Compressor or whatever else you're using. Transcode to DPX sequences using Glue Tools for a particularly high quality image well suited to finishing and effects work. If you want to work with the Cineform files created with a Cinedeck you'll at least need the decoder. Or if that sounds like too much work, the Cinedeck can also create ProRes or DNx for you at any quality including the excellent ProRes 4444. For this you'll need a 444 source but going dual link to the deck is no problem. It's got every in and out you can think of. I believe these 2 SDI links will also be able to record stereo images encoding to Cineform Neo3D in a future version. Because it's a computer, it's infinitely upgradeable and adaptable. There are multiple USB interfaces, eSata port, LAN port, antennae for increasing wi fi range, HDMI in and out, Dual Link HD-SDI in and out, multiple audio inputs, VGA out for desktop extension, breakout for component, standard def, and deck control, and probably some other stuff though can't forget about another one of my fav features - built in Ambient Timecode Master Clock. Jam it in the morning and forget about it. You can feed the LTC to all your other devices and it won't slip a frame. Very impressed with this. Especially in this day and age where we're often creating 2 or 3 different formats on-set. Having reliable timecode is super clutch and this feature on the Cinedeck makes it a little easier. Hats off to the Cinedeck team. Very nice people and if you need support, they're quick to respond. In usual Negative Spaces fashion, this is not an exhaustive product review, rather just a few thoughts from my own experience working with it. More in-depth information is available on their site.